This past January, American Enterprise Institute (AEI) economist Nicholas Eberstadt gave an interesting presentation on his book Men Without Work: America’s Invisible Crisis . In the presentation, Eberstadt contended that employment was falling among prime-age men primarily because of a declining interest in work. “The reason for this collapse of work for men,” he said, “has been a flight from work by men”. To show that the drop in employment is mostly about lack of desire rather than lack of economic demand, Eberstadt cites the decline in labour force participation among prime-age men. The labour force participation rate differs from the employment rate in that it includes people who are counted in the official unemployment rate – those who are out of work but have searched for a job in the past four weeks. The logic here is that if non-employed men wanted to work, they’d be out searching for a job and would therefore still be considered part of the labour force. However, there are plenty of people not in the labour force who would happily work if only they were given the opportunity. In fact, there are currently around 6 million Americans not in the labour force (NILF) who say they want a job. This figure is up by well over a million since 2007. If more of today’s jobless prime-age men are being counted as “NILF Want a Job” than in the past, the drop in prime-age men who want to work may be smaller than the drop in labour force participation. The data on prime-age men NILF who want to work are available for March of each year going back to the mid-1990s, which unfortunately isn’t as far back as Eberstadt goes. During this period, the labour force participation rate of prime-age men peaked at 91.5% and 91.4% in the years 1998 and 2000, respectively. Including data from 1999, the average prime-age male labour force participation rate for these three years was 91.3%. 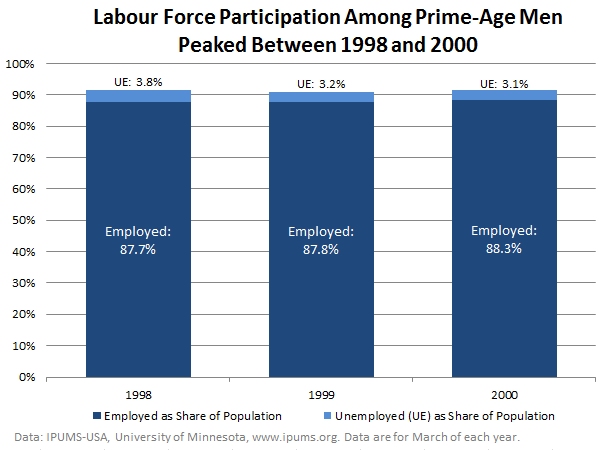 These were also the three years with highest prime-age male employment rates – 87.7% of prime-age men were employed in March 1998, 87.8% were employed in March 1999, and 88.3% were employed in March 2000. The years 1998-2000 represent the three-year peak for both the employment and civilian labour force participation rates of prime-age men. During each of these three years, very few prime-age men – less than 1.3% of the total prime-age male population – were counted as “NILF Want a Job”. There is almost no yearly variation between 1998 and 2000: the share of prime-age men falling into this category was 1.273% of the population in 1998, 1.275% in 1999, and 1.281% in 2000. 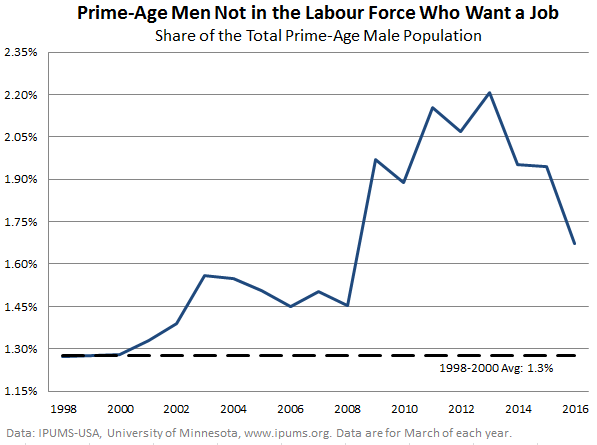 The figure below shows prime-age men NILF who want a job as a share of the prime-age male population from 1998 to 2016. The share went up slightly between 1998 and 2008, then spiked dramatically following the recession, eventually reaching a peak of 2.2% of the prime-age male population in 2013. So why are so many of today’s jobless prime-age men not being counted in the labour force? The answer is relatively simple: long-term unemployment. In the year leading up to the recession, there were about 400,000 prime-age men who had been unemployed and searching for work for over half a year; about 230,000 of them had been searching for a year or more. As can be seen in the figure below, by early 2010, the number of prime-age men suffering from long-term unemployment had increased about seven-fold. In 2014, Princeton University economist Alan Krueger looked at the probability of reemployment for workers who had been unemployed six months or longer during the Great Recession. He found that 15 months later, fully 34% of the long-term unemployed had given up searching for work. Just 30% were still unemployed and searching for work, while about 11% had landed steady, full-time jobs. It therefore seems unsurprising that a large number of prime-age men who wanted jobs would be classified as NILF following a period of extremely high long-term unemployment. There are two reasons why it’s important to look at the share of prime-age men NILF who say they want a job. If we extend this calculation through 2016, the shift to “NILF Want a Job” explains just over 12% of the drop in prime-age male labour force participation; however, this is largely for a good reason. Specifically, over the last two years, many prime-age men have reentered the labour market – showing that when workers actually see real job opportunities, they begin searching for work again. In fact, between 2014 and 2016, the share of prime-age men classified as “NILF Want a Job” fell 0.3 percentage-points, while the group’s labour force participation rate rose 0.5 percentage-points. Given that the share of prime-age men NILF who want jobs is still up by about a third relative to the late 1990s, it is likely that many of these men will reenter the labour force as the economy improves in the coming years. Still, one could perhaps argue that these people not in the labour force don’t have an immediate impact on the economy because they aren’t searching for work at that specific time . However, this point is also wrong. Previous labour market research indicates that the majority of all newly employed workers are counted as “NILF” rather than “Unemployed” the month before they are hired. Moreover, this hiring pattern corresponds quite strongly to the share of Americans NILF who say they want a job: as more and more non-employed Americans who want jobs are classified as “NILF” rather than “Unemployed,” more of the newly employed tend to come from outside of the official labour force. Not surprisingly, over the past four months , 63.7% of all newly employed men were counted as NILF the month before they were hired. It’s clear that the number of men who truly want to work is much greater than the labour force participation rate implies. This leads us to the second reason why it’s important to note the share of prime-age men NILF who say they want a job. This metric is important not just because of how much it has increased over time, but also because there are always at least some people who fall into this category. Take March 2016 as an example. According to the IPUMS data , there were 7.3 million prime-age men not in the labour force that month; yet there were not 7.3 million prime-age men who preferred not to work. Over 1.0 million prime-age men NILF said they wanted a job, while roughly 6.3 million – not 7.3 million – reported disinterest. Between 2011 and 2013 (using data from March of each year), approximately 1.3 million prime-age men NILF wanted to work. So taking the number of prime-age men NILF and saying that this was the number of prime-age men who didn’t want to work would’ve led to an exaggeration by about 1.3 million men. The exaggeration won’t be quite that severe most years, but it will always be there to at least some degree. Finally, there is one last point worth making. The topic being examined by Eberstadt and other conservative economists isn’t prime-age men’s low labour force participation rate per se , but rather this group’s low employment rate . In Eberstadt’s presentation, the phenomenon he was hoping to explain was why employment has fallen so much among prime-age men. Eberstadt only cited the declining labour force participation rate for this group as a way of arguing that the drop in employment was mostly being driven by a lack of interest among prime-age men rather than a lack of good job opportunities. As we’ve seen, the labour force participation rate is an imperfect measure of desire for work, given that many people outside of the labour force: a) say they want to work; and b) land jobs. But there is an even more basic issue at hand: if we are so concerned about the low employment rate of prime-age men, why not simply look at the employment rate itself? Much of the drop in male prime-age employment over the past three to four decades has occurred just since 2007. Between 1975 and 1987, the employment rate of prime-age men oscillated around 89.0%. Although their employment rate was slightly lower during the early 1990s, it had returned to 89.0% by 1999 and 2000. The rate fell as a result of the 2001 recession, but had risen back to 87.5% as of 2007. 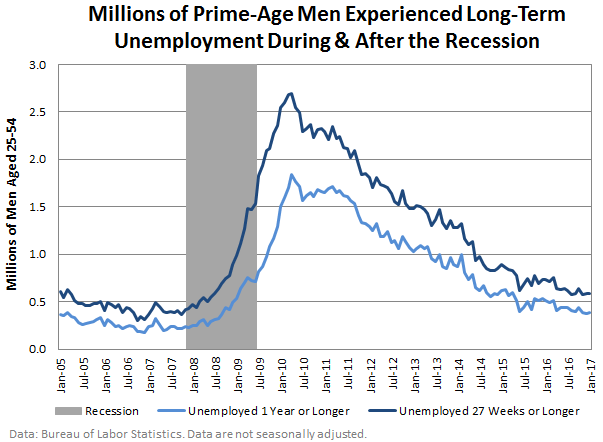 The 2008-2009 recession caused massive job loss, and as of December 2009, just 80.4% of prime-age men had a job. But men’s job prospects have been trending upward ever since, and in January, the prime-age male employment rate hit an eight-year high of 85.3% . This can be seen in the figure below. It can be argued that the drop in prime-age male employment before 2007 had nothing to do with cyclical weakness. This is a dubious point since the employment rate was trending upwards and hadn’t shown any indication of halting before the recession hit. There is at least some credibility to this argument. However, if any of the post-2007 drop has been due to supply-side factors, we haven’t seen a shred of evidence for it yet. If the problems were partially structural or supply-side, we’d have expected the prime-age male employment rate to level off at some point. It hasn’t. 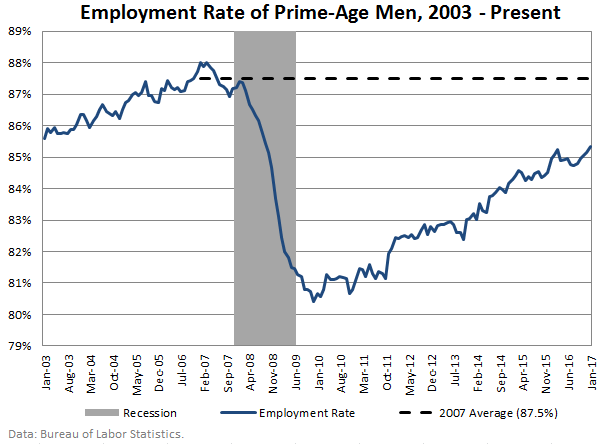 Since hitting a trough in December 2009, the prime-age male employment rate has never stopped rising . Unless policy-makers try to halt the recovery through fiscal austerity or monetary tightening, the employment rate for prime-age men will likely return to or exceed its 2007 annual average. And since a large portion of the decrease in male prime-age employment over the past 30 to 40 years has occurred just since 2007, there is considerable room for the job market to improve. So before declaring that men don’t want to work, we need to make sure they have the opportunity to work in the first place. The author thanks Shawn Fremstad and Rachel West of the Center for American Progress for helpful comments and feedback.